Sometimes you get the feeling that its really about time you posted about a band. It really is about time we posted about Bo Ningen. Brendan posted about Chicken Hawk earlier this week when they supported Bo Ningen and Pulled Apart By Horses a few months back at the 100 Club. The words "blown away" were used and they couldn't be more accurate. I think I've seen Bo Ningen live three or four times and they always make an impression, a mass of screaming riffs and flailing long black hair. Be it the confines of the 100 Club basement or climbing to the top (literally) of the main stage at this year's Offset. But why have I failed to post about Bo Ningen's brand of glorious Japanese progressive, psychedelic punk before? Maybe its because I've only seen Bo Ningen play their twisted, raging noise rock as a support role to other bands? With the reputation Bo Ningen have worked hard to achieve the Japanese four piece have kept very good company, Pulled Apart By Horses and Nisennenmondai spring to mind. Maybe its because the band's last release was 10" Koroshital Kimochi that dropped this time last year. 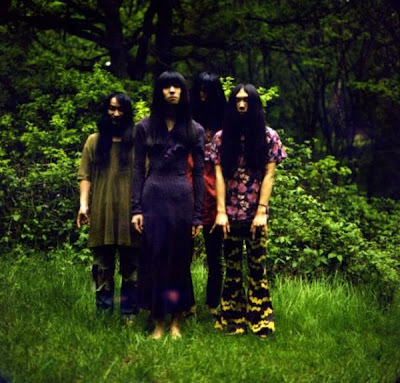 It seems Bo Ningen have been, for those in the know, their own insanely loud dark little secret. Whatever the reason, I suspect thats about to change. Bo Ningen's self titled L.P drops on Stolen Recordings early next month. I suspect things wont ever be the same again. Bo Ningen- Koroshitai Kimochi from Stolen Recordings on Vimeo.